A lifetime of Bright Smiles! Dental implants can restore damaged and missing teeth and they may be just what your smile needs. Our dentists are excited to live in and treat those of the Kamloops area. We put family first at Sunny Shores Dental. If you're intimidated by dental treatment, consider our sedation dentistry options. Call us to learn more! Welcome to Sunny Shores Dental! Dr. Foo and Dr. Vitoratos are proud to live in the Kamloops area. They and their team are excited to treat yourself and your family in a friendly, engaging environment that is dedicated to efficient, compassionate service. Both of our leading dentists have chosen to work in this area because they enjoy its beauty and its welcoming nature, and so they want to reflect the same principles in their dental practice. Dr. Foo and Dr. Vitoratos wish to treat your family as they would their own, and ensure that you feel cared for and appreciated with each visit. 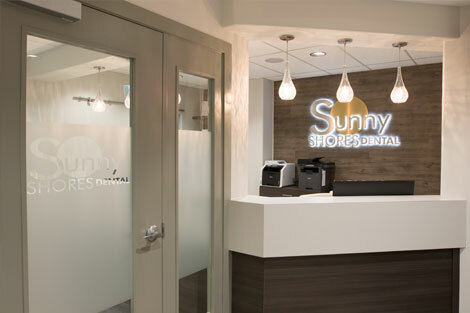 Sunny Shores Dental is dedicated to healthy teeth and gums for you and your loved ones, and we pride ourselves on offering honest advice and treatment.